Most homeowners don’t realise how much of a negative impact a cluttered home has on the entire family. When you walk into your house, you want to be welcomed with a homely sense of coziness; but instead, you feel stressed and saddened by the mess you see in the form of clutter. Though it’s hard to find the time to keep a household spick and span nowadays, you can’t neglect your home to the extent that you find more clutter lying around than useful things. If this is what it’s come down to, we suggest you take some time off and pay close attention to these decluttering tips below. Your home is a sanctuary for you and your family, so don’t put off cleaning it any longer. In a few simple ways, we’re going to show you how to get rid of the clutter in your home once and for all! Quality trumps quantity. Particularly when it comes to the things you have in your home. With that in mind, it’s time to pick out the useless, unwanted items that are causing clutter in every room of your house. It can be quite overwhelming at the beginning because you know you’ve got a long way to go, so start with a small portion and small items before moving on to bigger areas. For example, start with a side table that holds unwanted junkmail, old rubber bands, dried up pens, etc. Keep a large garbage bag by your side and start discarding these items without giving it a second thought (you may have an emotional attachment to certain little things but there’s a bigger picture here). Don’t forget to clear out drawers and cabinets too; these are spaces you’ll be shocked to find filled with junk you’re never going to use or need. With more storage space, you’ll be on the right track to keeping your home clutter-free. It’s common to find items around the house that haven’t been used in years, yet still have a place to call home within YOUR home. They only to add to the mess so don’t leave them out when decluttering your home. While many of us find sentimental value in our personal possessions, ask yourself who needs it more – you or someone less fortunate? Your favourite jackets and other clothing that no longer fit; those shoes that you know you’ll never wear again; old books just collecting dust on your shelves; and outdated electronics that could really make someone else’s day, are just a few things that we’re mentioning; surely you can think of some more. Donate them away! The satisfaction of giving is unparallel and it’s a win-win situation! You get to help someone else out and get one step closer to decluttering you home! Like every household, you have many material things in your home that are wanted and used on a regular basis. Obviously you can’t get rid of stuff like decorative curios, CDs, electronics and such; but what happens when these things are kept in a disorderly manner? Clutter strikes again! Many a times you’ll find table lamps, curios or coasters pushed aside to make room for a laptop or dinner plate, and left as is when these things are picked up. Believe us when we tell you that the few seconds it takes to put things back in place or even wrap up your chargers and put them away, is worth it! The problem in most homes, however, is that there is too much stuff and so little time to keep them neatly. Hence, if you remove all the rubbish from your house, keeping things in order will have never been easier! The source of clutter in your home is you (and other household members). The next time you see something that’s causing clutter in your home, stop and ask yourself how it got there. 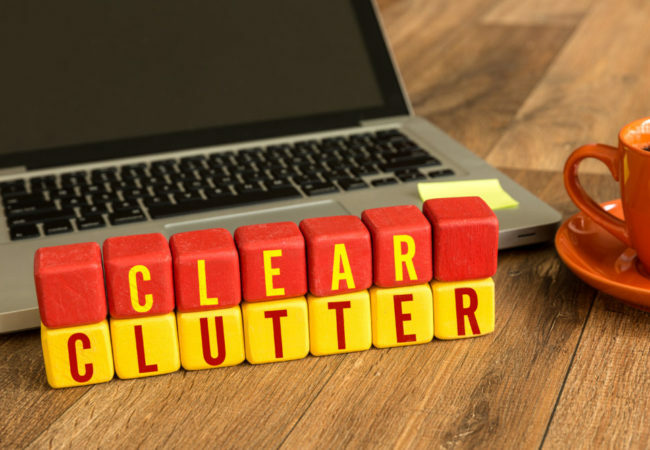 Anything from leaving empty shampoo bottles in the bathroom to cooking ingredients left on the kitchen counter; these are small, habitual things that lead to something much bigger – clutter! From this day onwards, get into the habit of throwing useless items away, putting things in their respective places and most importantly, never bring in or hold onto something that has no purpose or usefulness in your home. It also helps to do a weekly routine inspection to ensure that there is nothing lying around and causing clutter in your house. Simply Maid answers all your household cleaning prayers with simple cleaning tips, great guides and super service! To hire a reliable, efficient and professional cleaning service, look no further! We’re affordable and work at your convenience to keep your home spotless and tidy. It only take 60 seconds to book a cleaning with us and we’re raring to go! How to Cut the Stress and Make Move Out Cleaning a Success! Previous Post: When Chewing Gum Gets on Clothes, We Get it Off with These Tricks!